Apple has just dropped beta 4 of iOS 9.3 to members of Apple Developer program with compatible iPhone, iPad and iPod touch devices. This new seed comes about two weeks after Apple released beta 3 to both developers and public testers. If you are a registered developer with Apple Developer account, you can head over to developer.apple.com right now to download the new beta 4 IPSW file of iOS 9.3 for your device. If you are already running a previous beta version of iOS 9.3, simply head to Settings > General > Software Update on the device to grab the update directly using OTA (over-the-air) update method. Apple hasn’t made available iOS 9.3 beta 4 to members of Public Beta program yet but it’s only a matter of time before they do that. We will update the post whenever iOS 9.3 Public Beta 4 is seeded to public testers. iOS 9.3 is a major update for a point release. It brings a number of new features to iPhones and iPads, including Night Shift, multi-user login support on iPad for MDM customers, new 3D Touch Quick Actions for some of the stock Apple apps, ability to connect two Apple Watch units to a single iPhone, enhancements to first-party stock apps such as Apple News, Notes and Health, some enhancements to CarPlay, among other things. 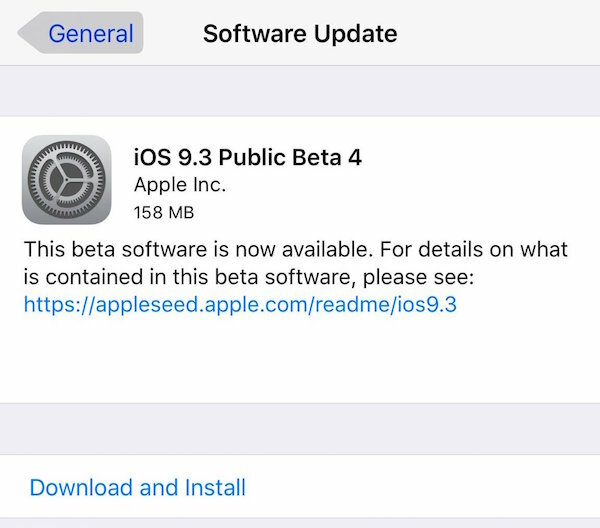 As for what’s new in iOS 9.3 beta 4 compared to previous beta 3 version, we are in the process of testing the new seed and as soon as we find the changes, we will add them down as updates in this post. Update x1: Apple appears to have updated icon for Control Center Night Shift toggle in iOS 9.3 beta 4. 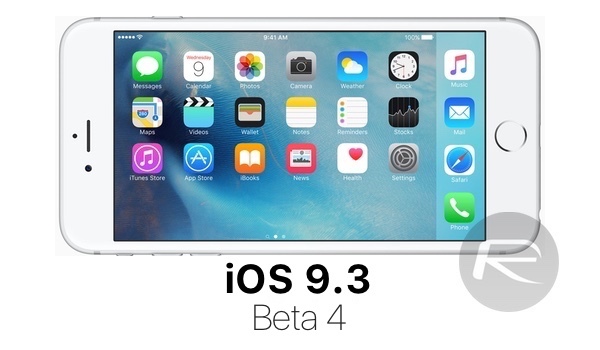 Update x2: As expected, Apple has now made available iOS 9.3 beta 4 to public beta testers. Landscape iPhone 6 in the article? Why is this not a real thing? Mine’s in landscape mode. Works perfectly. You have to remember, though, that it works only in the iPhone 6 Plus with the Standard Display Zoom. If you choose “Zoomed”, it won’t work. That’s a 6 Plus/6s Plus, NOT the smaller 6/6s. Its one of those things I wish Apple would give the choice instead of saying only the plus models get it. The article says it will be updated when it’s available for public beta testers and it’s available now but no update?